This article is about the bird family. For the fruit, see kiwifruit. For other uses, see Kiwi (disambiguation). Kiwi (/ˈkiːwi/ KEE-wee) or kiwis are flightless birds native to New Zealand, in the genus Apteryx and family Apterygidae. Approximately the size of a domestic chicken, kiwi are by far the smallest living ratites (which also consist of ostriches, emus, rheas, and cassowaries). The Māori language word kiwi is generally accepted to be "of imitative origin" from the call. However, some linguists derive the word from Proto-Nuclear Polynesian *kiwi, which refers to Numenius tahitiensis, the bristle-thighed curlew, a migratory bird that winters in the tropical Pacific islands. With its long decurved bill and brown body, the curlew resembles the kiwi. So when the first Polynesian settlers arrived, they may have applied the word kiwi to the new-found bird. The genus name Apteryx is derived from Ancient Greek "without wing": a-, "without" or "not"; pterux, "wing". The name is usually uncapitalised, with the plural either the anglicised "kiwis" or, consistent with the Māori language, appearing as "kiwi" without an "-s". There are five known species of kiwi, as well as a number of subspecies. Apteryx haastii great spotted kiwi or Roroa New Zealand The largest species, which stands about 45 cm (18 in) high and weighs about 3.3 kg (7.3 lb) (males about 2.4 kg (5.3 lb)). It has grey-brown plumage with lighter bands. The female lays just one egg, which both parents then incubate. The population is estimated to be over 20,000, distributed through the more mountainous parts of northwest Nelson, the northern West Coast, and the Southern Alps. Apteryx owenii little spotted kiwi Kapiti Island The small little spotted kiwi is unable to withstand predation by introduced pigs, stoats and cats, which have led to its extinction on the mainland. About 1350 remain on Kapiti Island. It has been introduced to other predator-free islands and appears to be becoming established with about 50 'Little Spots' on each island. A docile bird the size of a bantam, it stands 25 cm (9.8 in) high and the female weighs 1.3 kg (2.9 lb). She lays one egg, which is incubated by the male. Apteryx rowi Okarito kiwi, the rowi, or Okarito brown kiwi South Island The Okarito kiwi, first identified as a new species in 1994, is slightly smaller, with a greyish tinge to the plumage and sometimes white facial feathers. Females lay as many as three eggs in a season, each one in a different nest. Male and female both incubate. The distribution of these kiwi is limited to a small area on the west coast of the South Island of New Zealand. However, studies of ancient DNA have revealed that, in prehuman times, it was far more widespread up the west coast of the South Island and was present in the lower half of the North Island, where it was the only kiwi species detected. The Stewart Island southern brown kiwi, Apteryx australis lawryi, is a subspecies of Tokoeka from Stewart Island/Rakiura. The Northern Fiordland southern brown kiwi (Apteryx australis ?) and Southern Fiordland tokoeka (Apteryx australis ?) live in the remote southwest part of the South Island known as Fiordland. These sub-species of tokoeka are relatively common and are nearly 40 cm (16 in) tall. The Haast southern brown kiwi, Haast tokoeka, Apteryx australis ‘Haast’, is the rarest subspecies of kiwi with only about 300 individuals. It was identified as a distinct form in 1993. It occurs only in a restricted area in the South Island's Haast Range of the Southern Alps at an altitude of 1,500 m (4,900 ft). This form is distinguished by a more strongly downcurved bill and more rufous plumage. Apteryx mantelli or Apteryx australis North Island brown kiwi North Island The North Island brown kiwi, Apteryx mantelli or Apteryx australis before 2000 (and still in some sources), is widespread in the northern two-thirds of the North Island and, with about 35,000 remaining, is the most common kiwi. Females stand about 40 cm (16 in) high and weigh about 2.8 kg (6.2 lb), the males about 2.2 kg (4.9 lb). The North Island brown has demonstrated a remarkable resilience: it adapts to a wide range of habitats, even non-native forests and some farmland. The plumage is streaky red-brown and spiky. The female usually lays two eggs, which are incubated by the male. 1860s drawing of Apteryx, illustrating its distinctive features, including long beak, short legs and claws, and dark hair-like feathers. Their adaptation to a terrestrial life is extensive: like all the other ratites (ostrich, emu, rhea and cassowary), they have no keel on the sternum to anchor wing muscles. 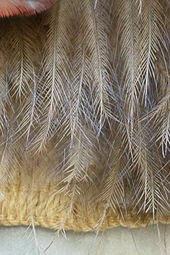 The vestigial wings are so small that they are invisible under the bristly, hair-like, two-branched feathers. While most adult birds have bones with hollow insides to minimise weight and make flight practicable, kiwi have marrow, like mammals and the young of other birds. With no constraints on weight due to flight requirements, brown kiwi females carry and lay a single egg that may weigh as much as 450 g (16 oz). Like most other ratites, they have no uropygial gland (preen gland). Their bill is long, pliable and sensitive to touch, and their eyes have a reduced pecten. Their feathers lack barbules and aftershafts, and they have large vibrissae around the gape. They have 13 flight feathers, no tail and a small pygostyle. Their gizzard is weak and their caecum is long and narrow. The eye of the kiwi is the smallest relative to body mass in all avian species resulting in the smallest visual field as well. The eye has small specialisations for a nocturnal lifestyle, but kiwi rely more heavily on their other senses (auditory, olfactory, and somatosensory system). The sight of the kiwi is so underdeveloped that blind specimens have been observed in nature, showing how little they rely on sight for survival and foraging. In an experiment, it was observed that one-third of a population of A. rowi in New Zealand under no environmental stress had ocular lesions in one or both eyes. The same experiment examined three specific specimens that showed complete blindness and found them to be in good physical standing outside of ocular abnormalities. A 2018 study revealed that the kiwi's closest relatives, the extinct elephant birds, also shared this trait despite their massive size. Unlike virtually every other palaeognath, which are generally small-brained by bird standards, kiwi have proportionally large encephalisation quotients. Hemisphere proportions are even similar to those of parrots and songbirds, though there is no evidence of similarly complex behaviour. Before the arrival of humans in the 13th century or earlier, New Zealand's only endemic mammals were three species of bat, and the ecological niches that in other parts of the world were filled by creatures as diverse as horses, wolves and mice were taken up by birds (and, to a lesser extent, reptiles, insects and gastropods). The kiwi's mostly nocturnal habits may be a result of habitat intrusion by predators, including humans. In areas of New Zealand where introduced predators have been removed, such as sanctuaries, kiwi are often seen in daylight. They prefer subtropical and temperate podocarp and beech forests, but they are being forced to adapt to different habitat, such as sub-alpine scrub, tussock grassland, and the mountains. Kiwi have a highly developed sense of smell, unusual in a bird, and are the only birds with nostrils at the end of their long beaks. Kiwi eat small invertebrates, seeds, grubs, and many varieties of worms. They also may eat fruit, small crayfish, eels and amphibians. Because their nostrils are located at the end of their long beaks, kiwi can locate insects and worms underground using their keen sense of smell, without actually seeing or feeling them. This sense of smell is due to a highly developed olfactory chamber and surrounding regions. It is a common belief that the kiwi relies solely on its sense of smell to catch prey but this has not been scientifically observed. Lab experiments have suggested that A. australis can rely on olfaction alone but is not consistent under natural conditions. Instead, the kiwi may rely on auditory and/or vibrotactile cues. Once bonded, a male and female kiwi tend to live their entire lives as a monogamous couple. During the mating season, June to March, the pair call to each other at night, and meet in the nesting burrow every three days. These relationships may last for up to 20 years. They are unusual among other birds in that, along with some raptors, they have a functioning pair of ovaries. (In most birds and in platypuses, the right ovary never matures, so that only the left is functional.) Kiwi eggs can weigh up to one-quarter the weight of the female. Usually, only one egg is laid per season. The kiwi lays one of the largest eggs in proportion to its size of any bird in the world, so even though the kiwi is about the size of a domestic chicken, it is able to lay eggs that are about six times the size of a chicken's egg. The eggs are smooth in texture, and are ivory or greenish white. The male incubates the egg, except for the great spotted kiwi, A. haastii, in which both parents are involved. The incubation period is 63–92 days. Producing the huge egg places significant physiological stress on the female; for the thirty days it takes to grow the fully developed egg, the female must eat three times her normal amount of food. Two to three days before the egg is laid there is little space left inside the female for her stomach and she is forced to fast. Lice in the genus Apterygon and in the subgenus Rallicola (Aptericola) are exclusively ectoparasites of kiwi species. Nationwide studies show that only around 5–10% of kiwi chicks survive to adulthood without management. 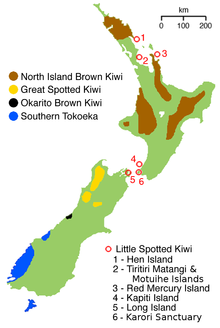 However, in areas under active pest management, survival rates for North Island brown kiwi can be far higher. For example, prior to a joint 1080 poison operation undertaken by DOC and the Animal Health Board in Tongariro Forest in 2006, 32 kiwi chicks were radio-tagged. 57% of the radio-tagged chicks survived to adulthood. Efforts to protect kiwi have had some success, and in 2017 two species were downlisted from endangered to vulnerable by the IUCN. In 2000, the Department of Conservation set up five kiwi sanctuaries focused on developing methods to protect kiwi and to increase their numbers. North island brown kiwi were introduced to the Cape Sanctuary in Hawke's Bay between 2008 and 2011, which in turn provided captive-raised chicks that were released back into Maungataniwha Native Forest. Operation Nest Egg is a programme run by the BNZ Save the Kiwi Trust—a partnership between the Bank of New Zealand, the Department of Conservation and the Royal Forest and Bird Protection Society. Kiwi eggs and chicks are removed from the wild and hatched and/or raised in captivity until big enough to fend for themselves—usually when they weigh around 1200 grams (42 ounces). They are then returned to the wild. An Operation Nest Egg bird has a 65% chance of surviving to adulthood—compared to just 5% for wild-hatched and raised chicks. The tool is used on all kiwi species except little spotted kiwi. In 2004, anti-1080 activist Phillip Anderton posed for the New Zealand media with a kiwi he claimed had been poisoned. An investigation revealed that Anderton lied to journalists and the public. He had used a kiwi that had been caught in a possum trap. Extensive monitoring shows that kiwi are not at risk from the use of biodegradable 1080 poison. Introduced mammalian predators, namely stoats, dogs, ferrets, and cats, are the principal threats to kiwi. The biggest threat to kiwi chicks is stoats, while dogs are the biggest threat to adult kiwi. Stoats are responsible for approximately half of kiwi chick deaths in many areas through New Zealand. Young kiwi chicks are vulnerable to stoat predation until they reach about 1–1.2 kg (2.2–2.6 lb) in weight, at which time they can usually defend themselves. Cats also to a lesser extent prey on kiwi chicks. These predators can cause large and abrupt declines in populations. In particular, dogs find the distinctive strong scent of kiwi irresistible and easy to track, such that they can catch and kill kiwi in seconds. Motor vehicle strike is a threat to all kiwi where roads cross through their habitat. Badly set possum traps often kill or maim kiwi. Habitat destruction is another major threat to kiwi; restricted distribution and small size of some kiwi populations increases their vulnerability to inbreeding. Research has shown that the combined effect of predators and other mortality (accidents etc.) results in less than 5% of kiwi chicks surviving to adulthood. Detail of the bottom edge of a kahu kiwi, showing the distinctive hair-like nature of the kiwi feathers. The Māori traditionally believed that kiwi were under the protection of Tane Mahuta, god of the forest. They were used as food and their feathers were used for kahu kiwi—ceremonial cloaks. Today, while kiwi feathers are still used, they are gathered from birds that die naturally or through road accidents or predation, or from captive birds. Kiwi are no longer hunted and some Māori consider themselves the birds' guardians. 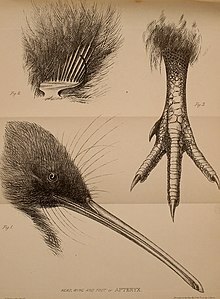 In 1813, George Shaw named the genus Apteryx in his species description of the southern brown kiwi, which he called "the southern apteryx". Captain Andrew Barclay of the ship Providence provided Shaw with the specimen. Shaw's description was accompanied by two plates, engraved by Frederick Polydore Nodder; they were published in volume 24 of The Naturalist's Miscellany. In 1851, London Zoo became the first zoo to keep kiwi. The first captive breeding took place in 1945. As of 2007 only 13 zoos outside New Zealand hold kiwi. The Frankfurt Zoo has 12, the Berlin Zoo has seven, Walsrode Bird Park has one, the Avifauna Bird Park in the Netherlands has three, the San Diego Zoo has five, the San Diego Zoo Safari Park has one, the National Zoo in Washington, DC has eleven, the Smithsonian Conservation Biology Institute has one, and the Columbus Zoo and Aquarium has three. The kiwi as a symbol first appeared in the late 19th century in New Zealand regimental badges. It was later featured in the badges of the South Canterbury Battalion in 1886 and the Hastings Rifle Volunteers in 1887. Soon after, the kiwi appeared in many military badges; and in 1906, when Kiwi Shoe Polish was widely sold in the UK and the US, the symbol became more widely known. During the First World War, the name "kiwi" for New Zealand soldiers came into general use, and a giant kiwi (now known as the Bulford kiwi), was carved on the chalk hill above Sling Camp in England. Usage has become so widespread that all New Zealanders overseas and at home are now commonly referred to as "Kiwis". The kiwi has since become the most well-known national symbol for New Zealand, and the bird is prominent in the coat of arms, crests and badges of many New Zealand cities, clubs and organisations; at the national level, the red silhouette of a kiwi is in the centre of the roundel of the Royal New Zealand Air Force. 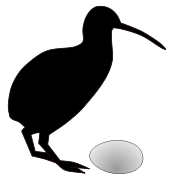 The kiwi is featured in the logo of the New Zealand Rugby League, and the New Zealand national rugby league team are nicknamed the Kiwis. The reverse of a New Zealand dollar coin contains an image of a kiwi, and in currency trading the New Zealand dollar is often referred to as "the kiwi". 1.^ Some petrels may exceed this. ^ a b Brands, Sheila (14 August 2008). "Systema Naturae 2000 / Classification, Family Apterygidae". Project: The Taxonomicon. Retrieved 4 February 2009. ^ Hemming, Francis, ed. (1958) . "Opinion 67. One hundred and two bird names placed in the Official List of Generic Names". Facsimile Edition of Opinions 1–133. Opinions and Declarations Rendered by the International Commission on Zoological Nomenclature. 1B. London: International Trust for Zoological Nomenclature. p. 179. ^ Gill (2010). "Checklist of the birds of New Zealand, Norfolk and Macquarie Islands, and the Ross Dependency, Antarctica" (PDF) (4th ed.). Te Papa Press. Retrieved 22 May 2016. ^ a b c Mitchell, K. J.; Llamas, B.; Soubrier, J.; Rawlence, N. J.; Worthy, T. H.; Wood, J.; Lee, M. S. Y.; Cooper, A. (23 May 2014). "Ancient DNA reveals elephant birds and kiwi are sister taxa and clarifies ratite bird evolution". Science. 344 (6186): 898–900. doi:10.1126/science.1251981. hdl:2328/35953. PMID 24855267. ^ "Birds: Kiwi". San Diego Zoo. Retrieved 19 September 2008. ^ "Kiwis/Kiwi - New Zealand Immigration Service (Summary of Terms)". Glossary.immigration.govt.nz. Retrieved 13 September 2012. ^ Gotch, AF (1995) . "Kiwis". Latin Names Explained. A Guide to the Scientific Classifications of Reptiles, Birds & Mammals. London: Facts on File. p. 179. ISBN 978-0-8160-3377-5. ^ "the definition of kiwis". Dictionary.com. Retrieved 17 November 2016. ^ "Please don't eat Kiwis". Another Spectrum. 17 August 2015. Retrieved 17 November 2016. ^ New Zealand. "Did small kiwi fly from Australia? - Canterbury Museum - New Zealand Natural and Human Heritage. Christchurch, NZ". Canterbury Museum. Archived from the original on 19 March 2014. Retrieved 30 July 2014. ^ "Great Spotted Kiwi Classification". University of Wisconsin. Retrieved 9 July 2008. ^ BirdLife International (2012). "Apteryx haastii". IUCN Red List of Threatened Species. Version 2013.2. International Union for Conservation of Nature. Retrieved 26 November 2013. ^ BirdLife International (2012). "Apteryx owenii". IUCN Red List of Threatened Species. Version 2013.2. International Union for Conservation of Nature. Retrieved 26 November 2013. ^ "Rowi: New Zealand native land birds". New Zealand Department of Conservation (DOC). Archived from the original on 19 February 2013. Retrieved 25 July 2009. ^ a b "Apteryx australis (brown kiwi)". Animal Diversity Web. Retrieved 26 March 2017. ^ BirdLife International (2008). "Northern Brown Kiwi". BirdLife Species Factsheet. Retrieved 6 February 2009. ^ McLENNAN, J.A. (1988). "BREEDING OF NORTH ISLAND BROWN KIWI, APTERYX AUSTRALIS MANTELLI, IN HAWKE'S BAY, NEW ZEALAND". New Zealand Journal of Ecology. 11: 89–97. JSTOR 24052821. ^ a b c d e Davies, S.J.J.F. (2003). "8 Birds I Tinamous and Ratites to Hoatzins". In Hutchins, Michael (ed.). Grzimek's Animal Life Encyclopedia (2nd ed.). Farmington Hills, MI: Gale Group. pp. 89–90. ISBN 978-0-7876-5784-0. ^ Moore, Bret A.; Paul-Murphy, Joanne R.; Tennyson, Alan J. D.; Murphy, Christopher J. (15 September 2017). "Blind free-living kiwi offer a unique window into the ecology and evolution of vertebrate vision". BMC Biology. 15 (1): 85. doi:10.1186/s12915-017-0424-0. ISSN 1741-7007. PMC 5602912. PMID 28915882. ^ "Study: Elephant Birds were Nocturnal, Possibly Blind | Paleontology | Sci-News.com". Breaking Science News | Sci-News.com. Retrieved 4 November 2018. ^ Corfield, J.; Wild, J.M. ; Hauber M.E. & Kubke, M.F. (2008). "Evolution of brain size in the Palaeognath lineage, with an emphasis on New Zealand ratites". Brain, Behavior and Evolution. 71 (2): 87–99. doi:10.1159/000111456. PMID 18032885. ^ Kolbert, Elizabeth (22 December 2014). "The Big Kill". The New Yorker. Retrieved 16 December 2014. ^ Cunningham, Susan; Castro, Isabel; Alley, Maurice (1 October 2007). "A new prey-detection mechanism for kiwi (Apteryx spp.) suggests convergent evolution between paleognathous and neognathous birds". Journal of Anatomy. 211 (4): 493–502. doi:10.1111/j.1469-7580.2007.00786.x. ISSN 1469-7580. PMC 2375824. PMID 17711422. ^ Save the Kiwi, NZ , formerly Kiwi Recovery. ^ Kinsky, F.C., (1971). The consistent presence of paired ovaries in the Kiwi (Apteryx) with some discussion of this condition in other birds. Journal of Ornithology 112(3): 334–357. ^ a b "The Kiwi Bird, New Zealand's Indigenous Flightless Bird". Archived from the original on 10 February 2010. Retrieved 16 January 2009. ^ Clay, Theresa (1960). "A new genus and species of Menoponidae (Mallophaga, Insecta) from Apteryx". Annals and Magazine of Natural History. Series 13. 3 (33): 571–576. doi:10.1080/00222936008651059. ^ Tandan, B. K. (1972). "The Species of Apterygon (Insecta: Phthiraptera: Amblycera) Parasitic on Kiwis (Apteryx)" (PDF). New Zealand Journal of Science. 15 (1): 52–69. ^ Palma, Ricardo L.; Price, Roger D. (2004). "Apterygon okarito a new species of chewing louse (Insecta: Phthiraptera: Menoponidae) from the Okarito brown kiwi (Aves: Apterygiformes: Apterygidae)". New Zealand Journal of Zoology. 31 (1): 67–73. doi:10.1080/03014223.2004.9518361. ^ Harrison, Launcelot (1915). "Mallophaga from Apteryx, and their Significance; with a Note on the Genus Rallicola" (PDF). Parasitology. 8 (1): 88–100. doi:10.1017/S0031182000010428. ^ Clay, Theresa (1972). "The Species of Rallicola (Insecta: Phthiraptera: Ischnocera) Parasitic on Kiwis (Apteryx)" (PDF). New Zealand Journal of Science. 15 (1): 70–76. ^ Palma, Ricardo L. (2017). Phthiraptera (Insecta) A catalogue of parasitic lice from New Zealand. Fauna of New Zealand. 76. Lincoln, New Zealand: Landcare Research. pp. 39–41, 186–188, 245. doi:10.7931/J2/FNZ.76. ISBN 978-0-947525-19-4. ^ a b c d "Facts and threats to kiwi". Department of Conservation. Retrieved 20 February 2018. ^ "Brown kiwi and rowi no longer considered endangered". NZ Herald. 5 December 2017. Retrieved 26 May 2018. ^ Macbrayne, Rosaleen (3 September 2004). "Poison campaigner fined after using kiwi in stunt". The New Zealand Herald. Retrieved 13 October 2011. ^ Robertson, HA; et al. (1999). "Survival of brown kiwi exposed to 1080 poison used for control of brushtail possums in Northland, New Zealand". Archived from the original on 29 September 2011. ^ Shaw, George; Nodder, Frederick P. (1813). "Apteryx australis. The Southern Apteryx". The Naturalist's Miscellany. 24. Plates 1057–1058. ^ "Captive management plan for kiwi" (PDF). New Zealand Department of Conservation. June 2004. p. 10. Retrieved 17 August 2009. ^ Gibson, Eloise (29 April 2010). "Shy envoys off on their OE". New Zealand Herald. p. a4. ^ "Kiwi Fun Facts". Smithsonian's National Zoo. 7 October 2016. Retrieved 23 November 2016. ^ Brooks, Miki. Lessons From a Land Down Under: Devotions from New Zealand. Lulu. pp. 3–4. ISBN 9780557098842. ^ "The Kiwi". About New Zealand. NZ Search. Archived from the original on 24 May 2010. Retrieved 16 January 2009. ^ "Kiwi falls after Wheeler talks down intervention, QE". The National Business Review. NZ. 27 October 2012. Retrieved 27 October 2012. ^ Kerry-Jayne, Kerry-Jayne. "Petrels, Breeding". Te Ara. Te Ara - the Encyclopedia of New Zealand. Retrieved 13 April 2019. ^ Sanz-Aguilar, Ana. "Is Laying a Large Egg Expensive? Female-Biased Cost of First Reproduction in a Petrel". BioOne Complete. Retrieved 12 April 2019. SavetheKiwi.org "Producing an Egg". Archived from the original on 29 June 2007. Retrieved 13 August 2007. "Kiwi (Apteryx spp.) recovery plan 2008–2018. (Threatened Species Recovery Plan 60)" (PDF). Wellington, NZ: Department of Conservation. 2008. Retrieved 13 October 2011. Wikimedia Commons has media related to Apteryx. Look up kiwi in Wiktionary, the free dictionary. Wikisource has the text of the 1920 Encyclopedia Americana article Apteryx. "Great Spotted Kiwi", Species: birds, ARKive, archived from the original on 14 June 2007, retrieved 31 October 2006 . 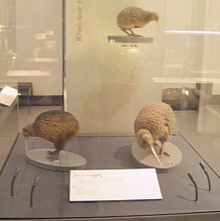 "Land birds: Kiwi", Native animals: birds, NZ: Department of Conservation, archived from the original on 3 October 2009, retrieved 25 July 2009 . Kiwi recovery, NZ: BNZ Save The Kiwi Trust . How the Kiwi Lost his Wings (Maori legend), /hoopermuseum.earthsci.carleton.ca . "Kiwi", Te Ara – the Encyclopedia of New Zealand, NZ: The Government, archived from the original on 8 June 2008 . "North Island Brown Kiwi feeding in the wild", YouTube (daylight video) . Pests & threats, Taranaki Kiwi Trust, archived from the original on 2 April 2012 . "Case studies on 1080: the facts", 1080 and kiwi, NZ: 1080 facts, archived from the original on 2 December 2011 .